Can textiles support mindfulness and wellbeing in an urban environment? 1 in 4 people in the UK are diagnosed with depression and anxiety. Being in contact with nature is proven to reduce stress and support well-being where flowing lines, soft tones and sounds support mindfulness. Mindfulness is the act of focusing ones attention and being present in the moment by engaging the senses. Inspired by natural forms and textures, my work aims to evoke mindfulness by engaging the senses and supporting calm and well-being. These therapeutic objects are intended to be interacted with; where individuals can press the spongy third dimensional shapes, place their fingers in the ‘finger cups’ and stroke smooth ‘worry stones’ informed by research into therapeutic objects. Like therapeutic blankets these pieces are weighted to give a sense of comfort and protection. Woven cords and hand-formed ‘beads’ are to be rubbed and turned in the hand and are intended to be talismanic; imbued with a sense of protection, comfort and potency. Their form is reminiscent of the serendipity of curiosities found, collected and cherished at the seashore. They aim to evoke memories of being in nature and the sense of calm associated with this; despite being disconnected from nature in an over-stimulating urban environment. Nature Talismans, textiles: digital print, screen print, embroidery, hand-painted silk. Returning to this work at this stage; I would like to further encompass the senses by adding a storytelling and nature soundtrack into the pieces. 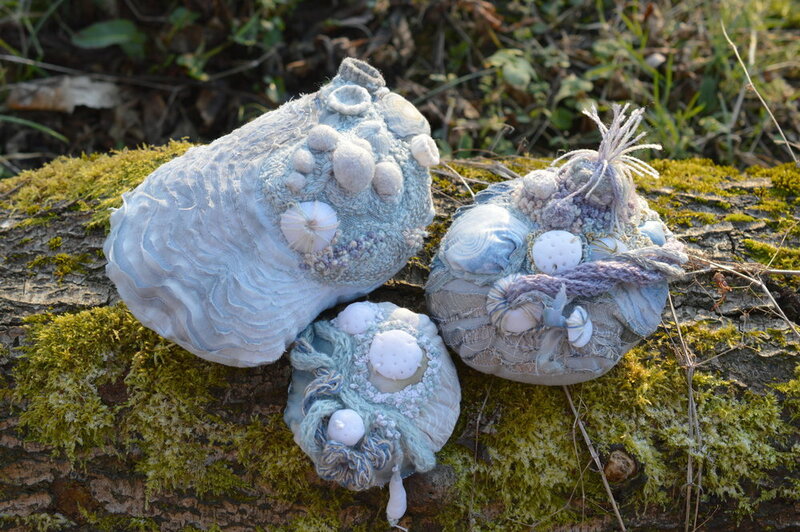 Funding would support the outreach of these therapeutic handling objects to support the well-being of individuals in nature-devoid environments such as hospitals or care settings as part of a sensory therapeutic storytelling experience. Why do we accept this way of living?